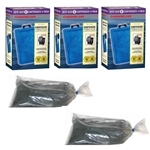 The Marineland Emperor Rite-Size E Filter Cartridges (4-Pack) Replacement for the fits all emperor Bio-Wheel Filtration Systems. This item is THREE of the 4-Packs. The Marineland Emperor Rite-Size E Filter Cartridges (4-Pack) Replacement for the fits all emperor Bio-Wheel Filtration Systems. This package will provide you with one year of filter cartridges and carbon for an Emperor 400 Filter (two years for a Emperor 280). There are a total of twelve Marineland Emperor Rite-Size E Filter Cartridges in the package (THREE of the 4-Packs). The Marineland 400 takes two cartridges and they should replaced every two months. The Inland Seas Carbon is pelletized and will be secure in the two refillable media containers that come with the Emperor 400. Each container holds four ounces of carbon. If you replace your carbon every two months the 3 pounds of carbon (48 ounces) will be enough for one year.